[139 Pages Report] The global blockchain government market size was USD 104.5 Million in 2017 and is projected to reach USD 3,458.8 Million by 2023, at a Compound Annual Growth Rate (CAGR) of 84.5% during the forecast period. The base year considered for the study is 2017, and the forecast period is from 2018 to 2023. The objective of the report is to define, describe, and forecast the blockchain government market by provider, application, and region. The report analyzes the opportunities in the market for stakeholders by identifying the high-growth segments of the market. It profiles the key players of the market and comprehensively analyzes their core competencies, such as new product launches, partnerships, agreements, and collaborations. The report also covers detailed information regarding the major factors (drivers, restraints, opportunities, and challenges) influencing the growth of the market. The blockchain government market comprises major service providers, such as, IBM (US), SAP (Germany), Microsoft (US), Oracle (US), Deloitte (US), AWS (US), Infosys (India), Bitfury (the Netherlands), Auxesis Group (India), Cegeka (the Netherlands), Factom (US), BTL (Canada), SpinSys (US), OTC Exchange Network (US), ModulTrade (UK), Blocko (South Korea), Symbiont (US), brainbot technologies (Germany), Guardtime (Estonia), BigchainDB (Germany), Somish (India), RecordsKeeper (Spain), Intel (US), Accenture (Ireland), and Blockchain Foundary (Singapore). The stakeholders include government agencies, blockchain technology vendors, independent software vendors, consulting firms, system integrators, Value-added Resellers (VARs), and Information Technology (IT) agencies. Detailed analysis was performed to get detailed information regarding the competitors in the blockchain government market, on the basis of their solutions offerings and business strategies. The report reviews the major players offering blockchain technology solutions and services. In addition, the report will outline the findings and analysis on how well each blockchain technology solution provider performs within the MarketsandMarkets criteria. 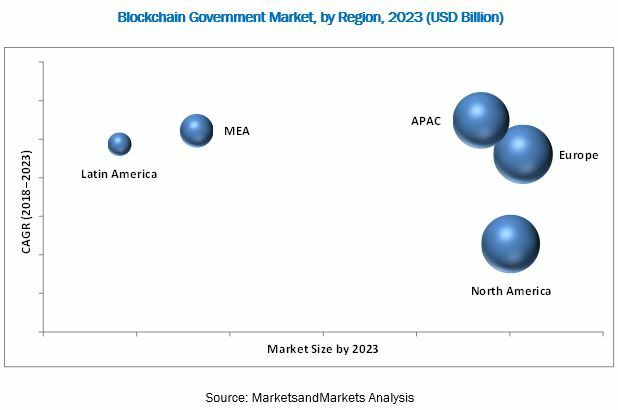 The blockchain government market is expected to grow from USD 162.0 Million in 2018 to USD 3,458.8 Million by 2023, at a Compound Annual Growth Rate (CAGR) of 84.5% during the forecast period. The major drivers of the market include the growing interest in the blockchain technology adoption by the government sector, increasing instances of fraudulent activities in the public sector, need to provide protection against data tempering, upswing in the usage of blockchain technology to create transparent and decentralized government, and focus on increasing efficiency and speed in public sector transactions. 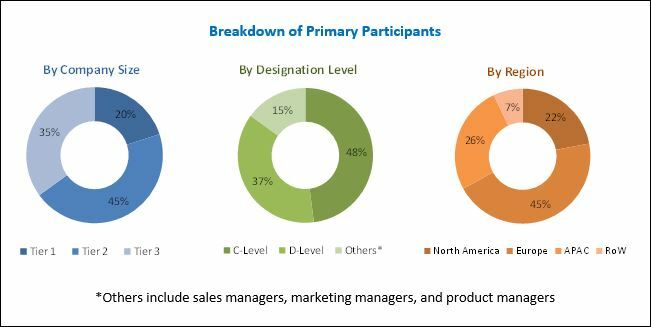 The blockchain government market study aims at estimating the market size and future growth potential of the market across different segments, such as provider, application, and region. The application segment includes, asset registry (land/real estate registry), identity management, payments, smart contracts, elections/voting, and others (healthcare, public transport, and supply chain & logistics). The smart contracts segment is expected to dominate the application segment in terms of contribution to the overall market, as government agencies are deploying blockchain based smart contracts to reduce costs of verification, execution, arbitration and fraud prevention. The blockchain government market has been segmented on the basis of providers into 3 categories: application providers, middleware providers, and infrastructure providers. These providers offer infrastructure to develop in the blockchain-based platforms. Among these segments, the application providers segment is the fastest growing segment in the overall market. The introduction of technologically advanced blockchain solutions has witnessed a certain level of adoption in government agencies thereby fueling the overall market growth. In terms of geographic coverage, the blockchain government market has been segmented into 5 regions, namely, North America, Asia Pacific (APAC), Europe, the Middle East and Africa (MEA), and Latin America. North America is estimated to account for the largest share of the overall market in 2018. North America is considered as the most advanced region in technology adoption and infrastructure. The wide presence of key industry players of blockchain technology solutions in this region is the main driving factor responsible for the growth of the market. Governments in this region are moving toward the adoption of the blockchain technology. However, Europe is expected to surpass North America in 2023. The Estonian government is one of the early adopters of the blockchain technology in the European region. Furthermore, APAC is expected to grow at the highest growth rate during the forecast period, due to the increase in government expenditure on blockchain technology solutions to change the business processes in the government sector. Key financial hubs and massive shipping and trading markets, including Hong Kong and Singapore, provide large users of the blockchain in the public sector. However, lack of awareness and technical understanding about the blockchain technology can act as a restraining factor for the blockchain government market growth across regions. The major vendors of the blockchain government market include IBM (US), SAP (Germany), Microsoft (US), Oracle (US), Deloitte (US), AWS (US), Infosys (India), Bitfury (the Netherlands), Auxesis Group (India), Cegeka (the Netherlands), Factom (US), BTL (Canada), SpinSys (US), OTC Exchange Network (US), ModulTrade (UK), Blocko (South Korea), Symbiont (US), brainbot technologies (Germany), Guardtime (Estonia), BigchainDB (Germany), Somish (India), RecordsKeeper (Spain), Intel (US), Accenture (Ireland), and Blockchain Foundary (Singapore). These players have majorly adopted partnerships and new product launches as the key growth strategies to offer feature-rich blockchain technology solutions to their customers and enter new regional markets.